Back outside, Avingard noticed two large Nord men talking to an elderly lady. He recognized the lady as the owner of the stall directly in front of the Bannered Mare, as he remembered seeing her as he passed by. Neither the men of the woman seem to be in any sort of good mood. He stopped just close enough that he could listen to the conversation. Upon closer inspection, Avingard also recognized one of the Nords as the one talking to Adrianne as he entered Whiterun. “Do you believe this old hag?” the older Nord asked as he turned to the other Nord. With that, the two Nords turned and walked away, leaving the elderly woman in tears as she returned to work behind her stall. Avingard thought about the situation and how the Civil War has created divisions among neighbors and former friends. He stopped the thought we he noticed Carlotta busy sweeping the street behind her stall. He walked over to her. “Mikael won’t be bothering you anymore,” Avingard said as Carlotta looked up at him. She handed Avingard two hundred and fifty gold coins. He thanked her for the reward and then headed down the street the Warmaiden’s. Adrianne was busy working outside as Avingard approached her. “I would like some steel armor to replace this iron armor,” Avingard replied. Adrianne found some steel armor and sold it to Avingard. The armor fit Avingard nicely, and he already felt better about going into combat with better protection. Not needing the iron armor anymore, and also because it was heavy to carry around, he sold it to Adrianne. 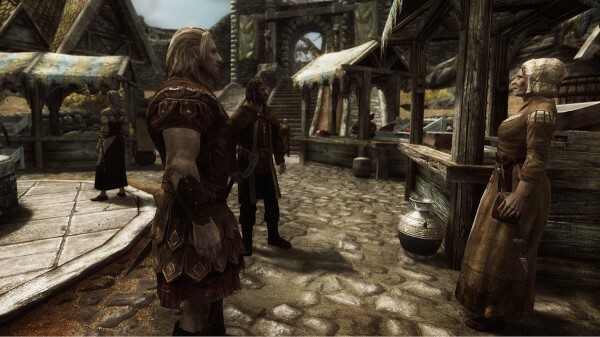 Even after selling the iron armor, Avingard still didn’t have enough to replace his iron boots, so he thanked Adrianne for the armor and walked back to the market and the Bannered Mare. She escorted Avingard to the second story of the inn where are room with a comfortable bed overlooked the main room below. After watching the patrons for a few moments, Avingard ate some bread and then removed his armor. He laid down on the bed and quickly fell asleep. Absolutely love reading this! May I ask what ENB and mods your using? I am actually using quite a bit of mods, too many to mention in this comment. I will look at creating a page of the mods I use. As for the ENB, I can’t remember as I have been experiencing with different ENB settings. If I can figure out which one I’ll let you know.